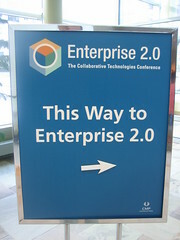 Dion Hinchcliffe, as many of you know, is one of the leading pioneers in the Enterprise 2.0 movement. His regular blog posts on ZDNet and at the SOA Web Services Journal have explained concisely and eloquently how to apply web 2.0 in the enterprise. Yesterday, Hinchcliffe & Co. announced its Web 2.0 University. The university will be providing high-end Web 2.0 and Enterprise 2.0 education solutions and premier consulting services in partnership with O’Reilly Media who delivered the concept and the term “web 2.0” to the industry. The early registration list of A-list customers for the University is impressive. Classes and seminars for Web 2.0 University will be offered around the world in a variety of locations starting this year. The core curriculum consists of five courses, beginning with “bootcamps.” The next scheduled is the Enterprise 2.0 Academy ™ which aims to provide real-world, hands-on information on how to transform the enterprise. The first bootcamps will be held December 12th and 13th at the Carlyle Center in historic Alexandria, VA.
Hinchcliffe’s partnership, also announced yesterday with with Tim O’Reilly’s O’Reilly Media to deliver a suite of educational and consulting offerings to enterprise customers is a further testament to Hinchcliffe’s rising status as a thought-leader in the web 2.0 market. Tim O’Reilly certainly could have chosen literally anyone in the industry to partner with, but he chose Hinchcliffe. The combination of O’Reilly’s reach into global corporations and Hinchcliffe’s passion and depth of understanding for the technology that is fueling Enterprise 2.0 advances is an unparalleled match for consulting and education services. Andrew McAfee recently wrote about “Evangelizing in the Empty Quarter.” With this O’Reilly and Hinchcliffe partnership, that quarter will be populated in no time. Remember, the “Rub’ al Khali” is one of the most oil-rich places in the world.